Stained glass cookie is a rather trendy bake in Asia in recent years ..The cookie is also named as “Cathedral or church window “ cookies. 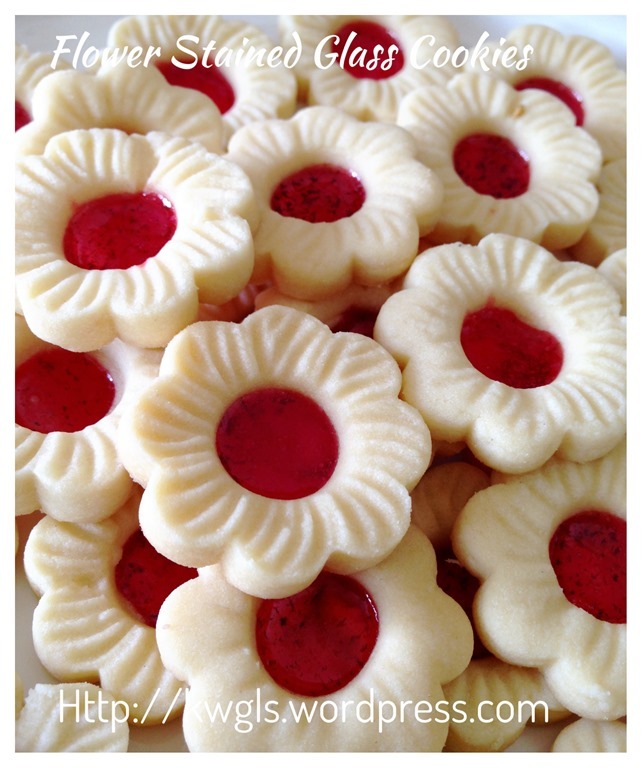 It is a cookie that have a candy in the centre resembling the tinted glass windows in some old European buildings. 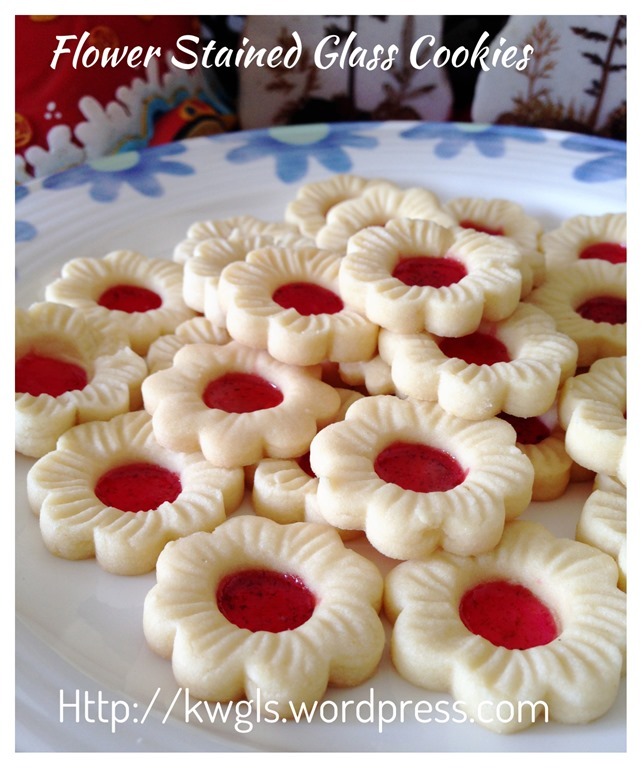 Many people have baked this as last year’s Christmas cookies…. 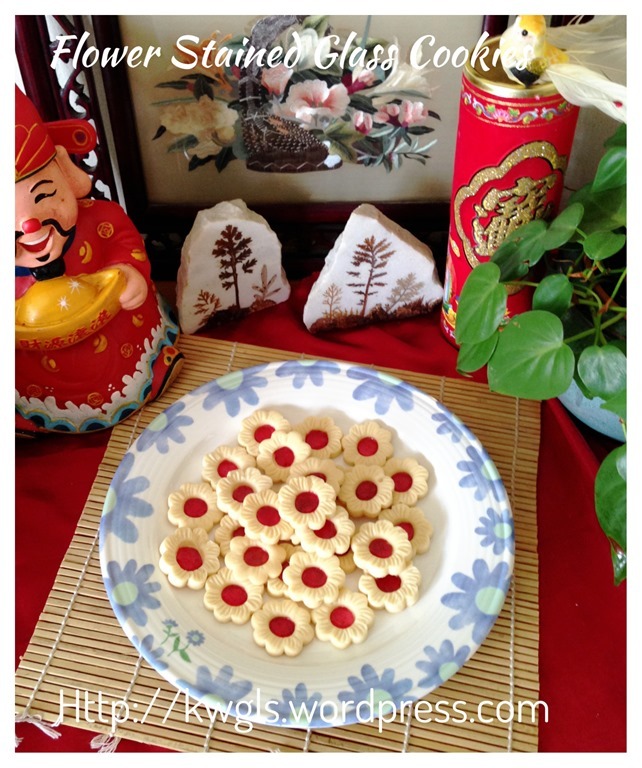 However, I have decided to push back this recipe to Chinese New Year as I believed it is a perfect cookie for this auspicious Chinese festival. I purposely choose one design that shaped like flowers.. 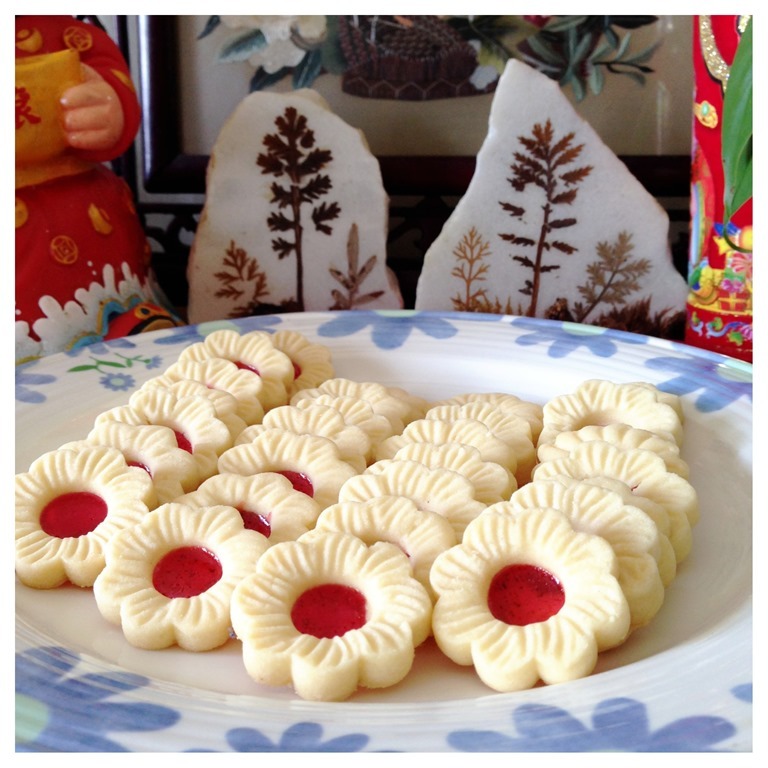 Since it is spring festival, flowers will blossom signifying a new year has arrived. 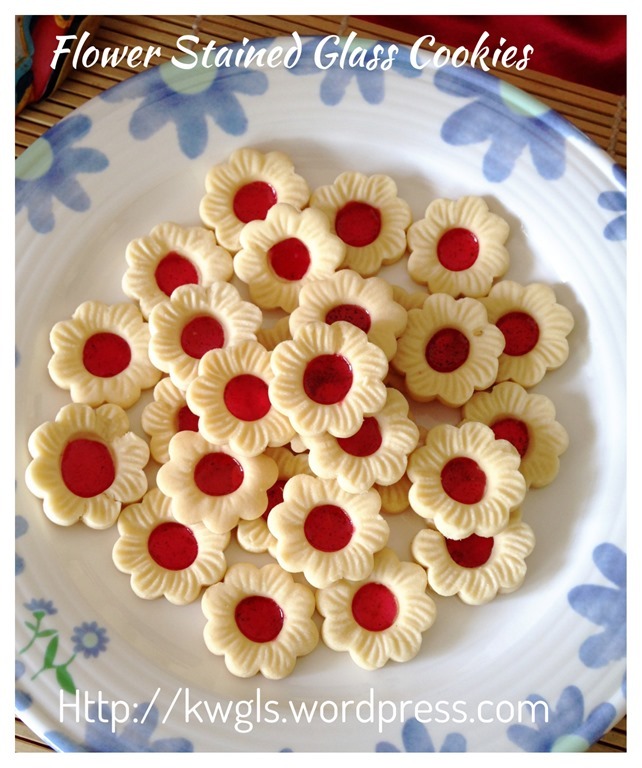 After consultation with members of some Facebook Groups, I have decided to name this as Cherry blossom cookies since I already have a plum blossom cookies recipe. 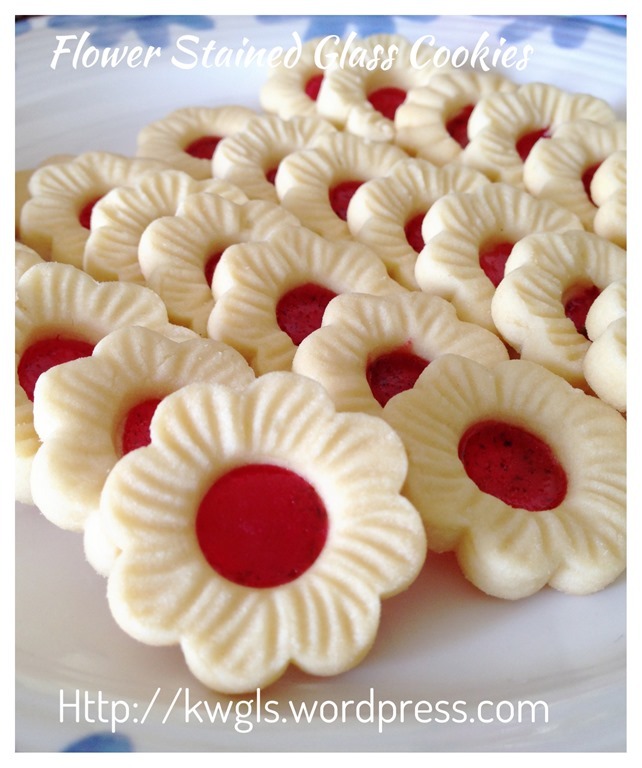 Unlike other recipes in the net, this recipe is very simple.. no difficult ingredients and what you need are just 4 main ingredients: flour, sugar, butter and some hard candy. No complicated and specialized mould is required. 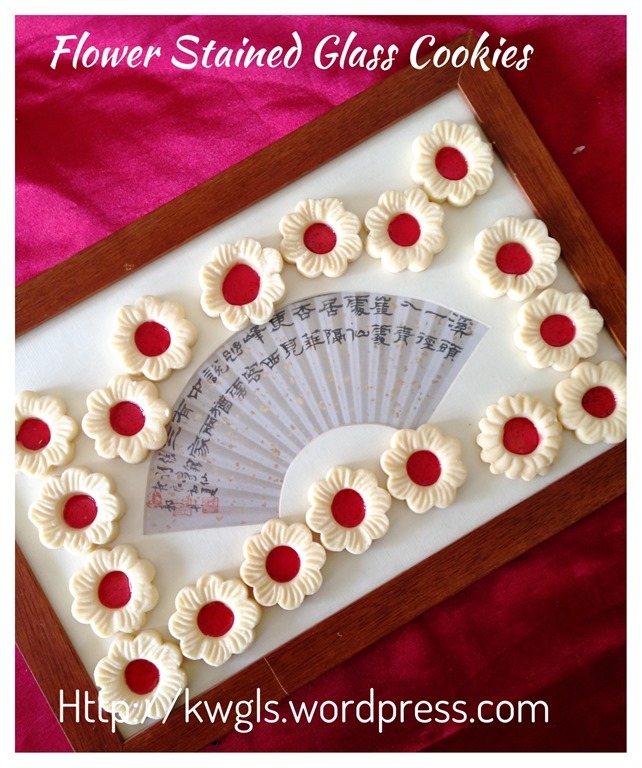 I use my pineapple tarts mould and do an additional step of cutting of the centre. It was pretty easy actually. For the hard candy, it can be of any type, any brand, and any colour. For purpose of Chinese New Year, I am quite insistent that the colour has to be red… I did not go until the extent of searching in the supermarket to look for the candy that I wanted. I just went to the neighbourhood provision shop, asking for red hard candy. Apparently, hard candy seems to have “lose out” to soft candy. I can’t get any one and I eventually bought the Strepsil cherry flavour for this illustration. However, i am rather confident that you can get it in larger supermarkets with Fox brands or others. Cream the butter and icing sugar until light and fluffy. 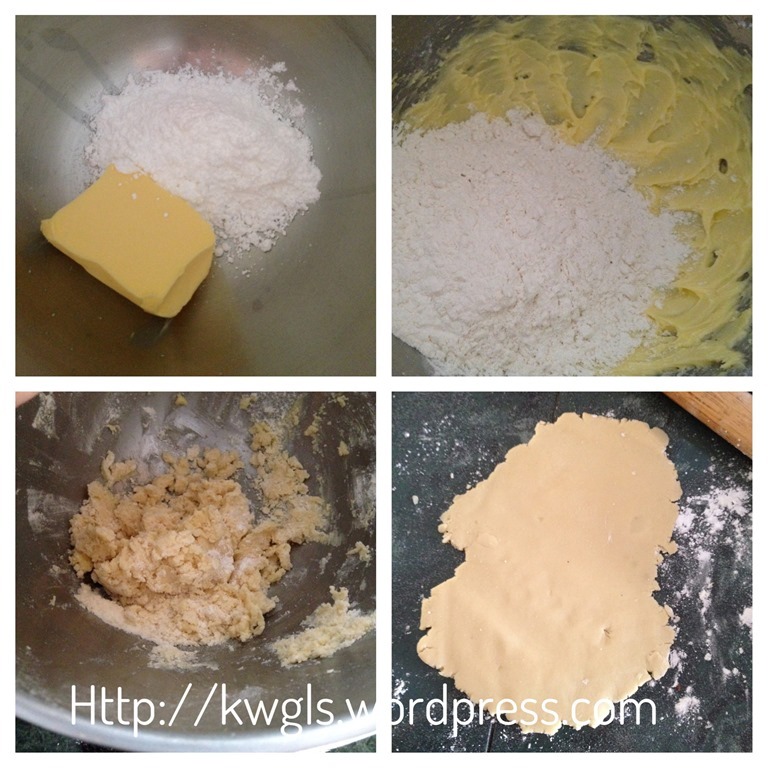 Add in the flour, stir until well mixed. 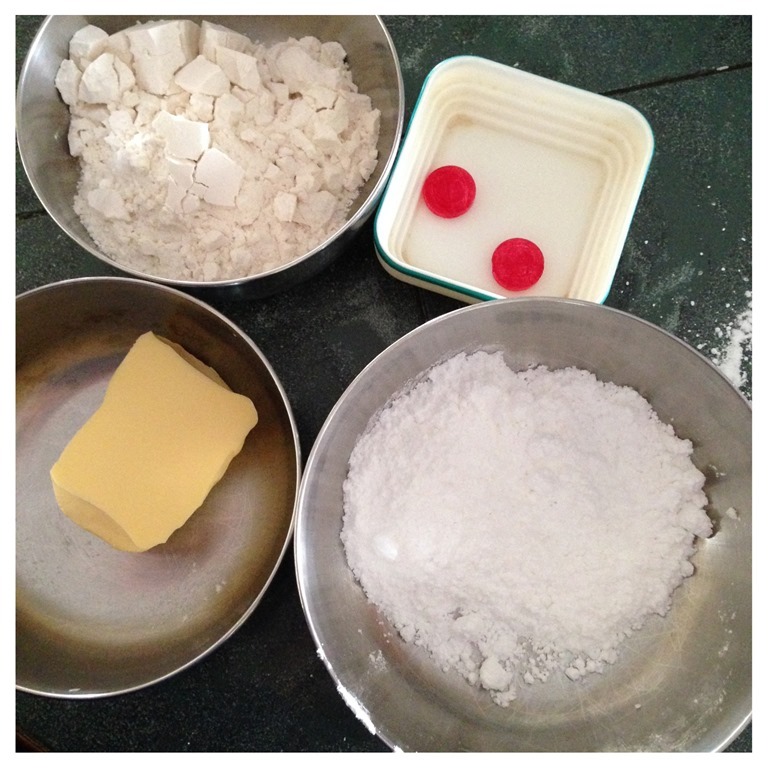 Transfer the dough out to a lightly floured surface. Roll the dough into about 5 mm thickness. 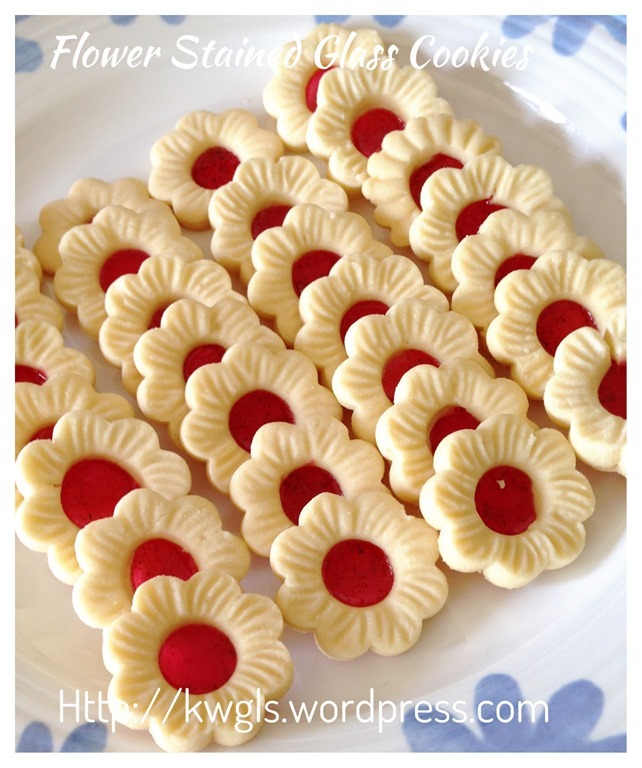 Use your preferred mould to mould the dough. 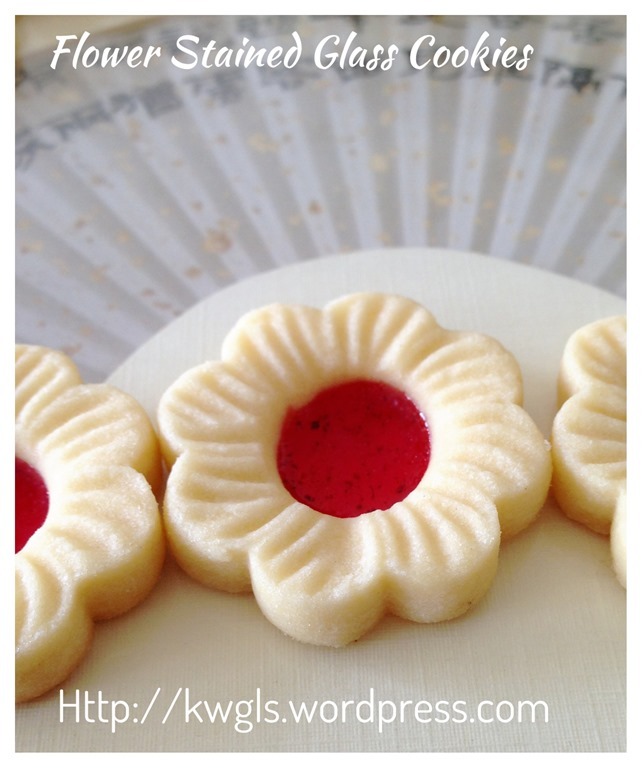 Cut off the centre of the flower (I have use a simple piping nozzle). Bake in the preheated oven of 160 degree Celsius for 10 minutes. While the cookies are baking, use something to break the hard candy. 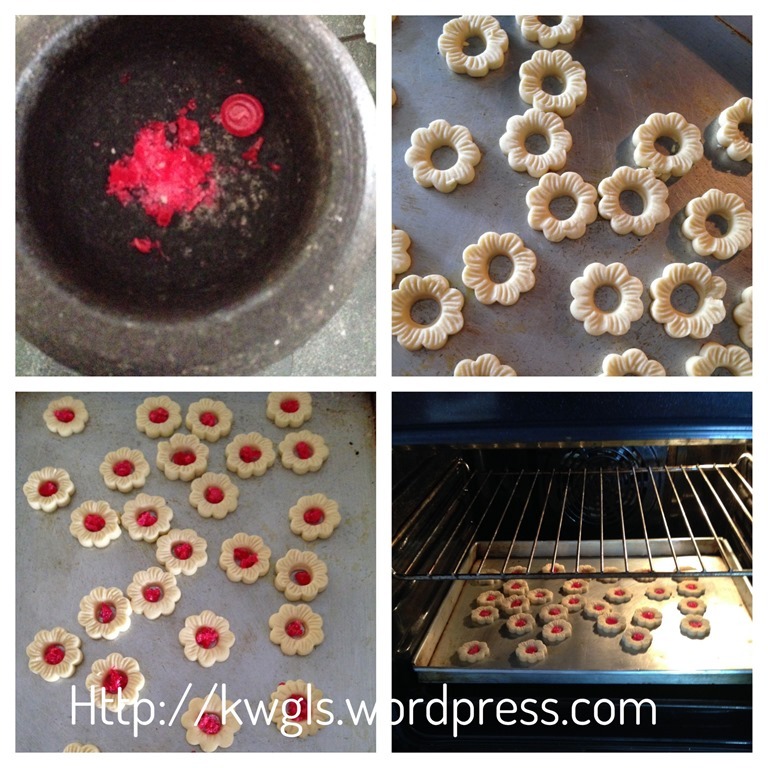 When the cookies are ready, take out, put a small amount of hard candies in the cavity at the centre of the cookies. Send back to the oven and bake for another 10 minutes. Let the cookies cooled completely in the baking tray before removing it and store in an air tight container. 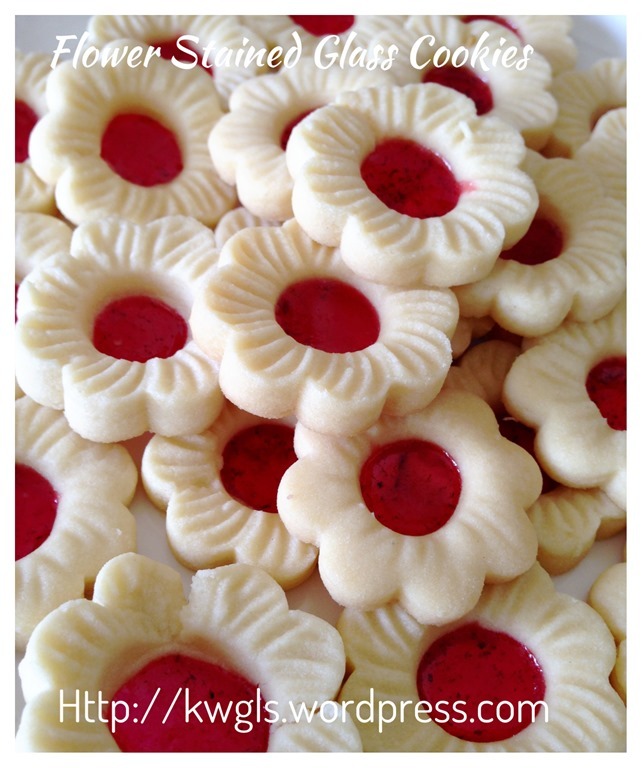 This cookie is definitely not a difficult cookie to prepare. It is rather easy and do not ask me where I get my mould.. 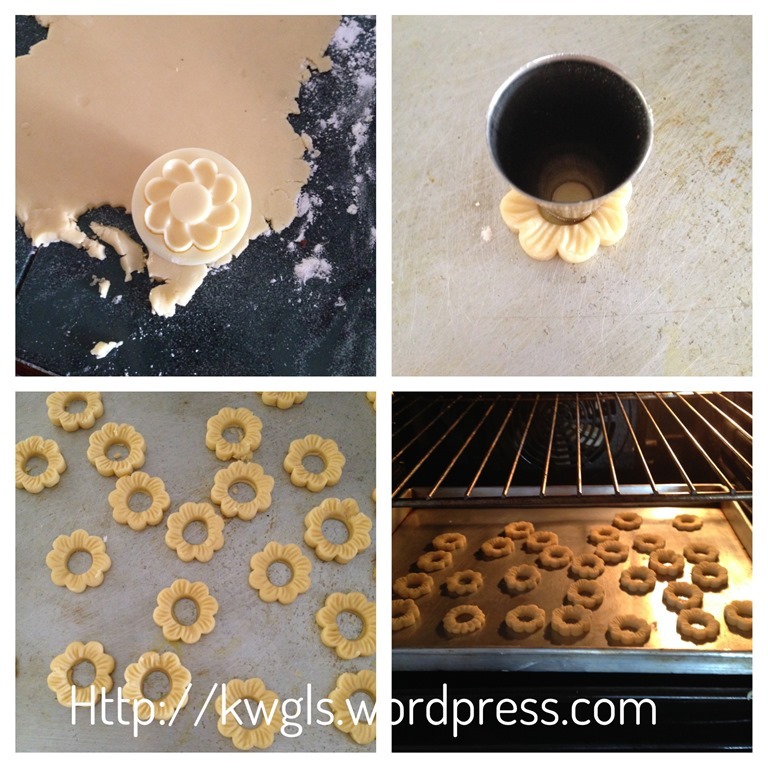 In fact, any pineapple tarts mould will be able to give you a beautiful design. I got mine in a neighbourhood shop and have been with me for many years. Do play around with the colour and patterns of your mould .. 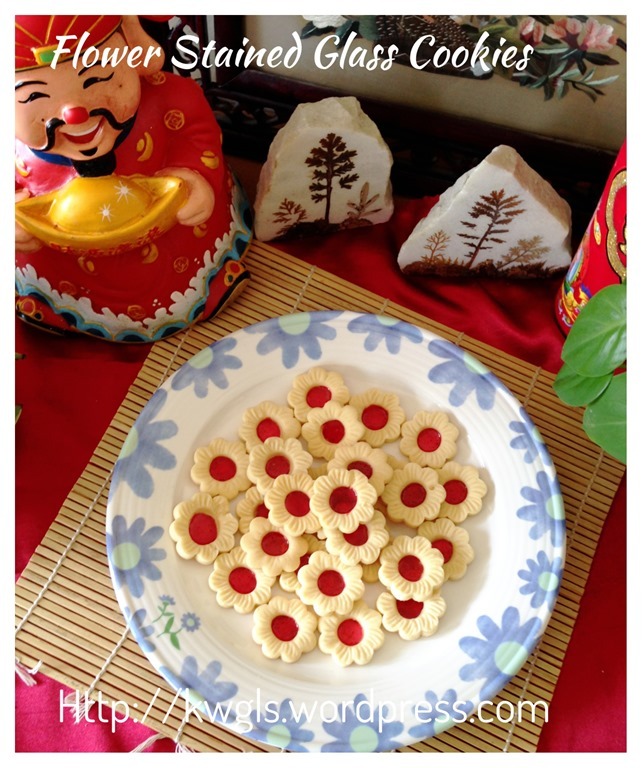 This entry was posted in Cakes and cookies, Chinese New Year 2014, Food Preparation Series and tagged 8, chinese new year 2015, GUAI SHU SHU, Guaishushu, kenneth goh, postaday, 樱花玻璃曲奇， cherry blossom stained glass cookies. Bookmark the permalink. Hi, I’m trying to make this cookie however the dough just coukdnt be rolled out nicely. It starts cracking and is too soft to be handled. Can you advise what can I do now? 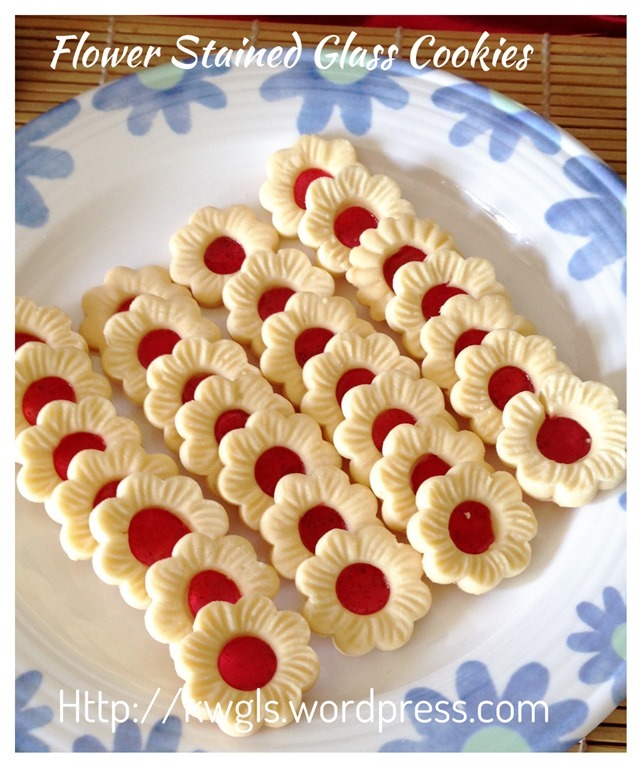 These flower stained glass cookies are very lovely and pretty !